De-Lawrence Lamptey has a PhD in rehabilitation science and a master’s degree in clinical psychology. He has right-sided weakness related to cerebral palsy and grew up in Ghana. “When I was growing up I was less aware of my disabilities than I am now,” he says. 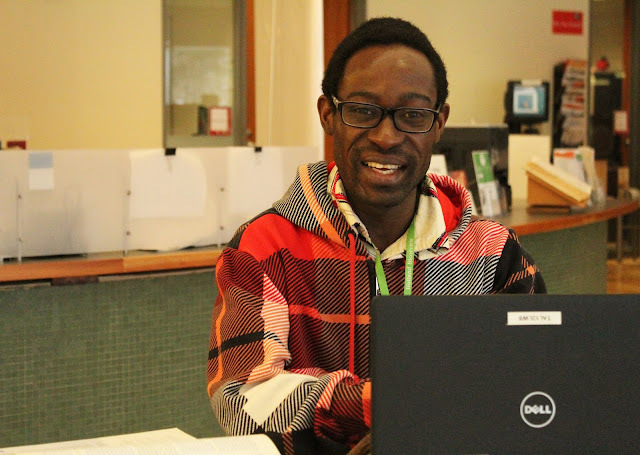 “I was born with a disability, but I was never raised as a person with a disability.” De-Lawrence is a postdoctoral fellow doing research in inclusion and participation at Holland Bloorview with senior scientist Gillian King. De-Lawrence Lamptey: I was born with a disability. I have a form of CP that affects my right arm and leg. But I grew up in Ghana feeling I was just as normal as any typically developing child. 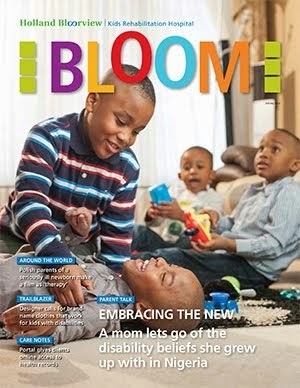 BLOOM: Doesn’t that culture hold negative attitudes about disability? De-Lawrence Lamptey: Yes. They attach superstitious beliefs to disability, so they believe it’s caused by a sin or a curse. I was teased, but it didn’t affect my goals in life, or the way I perceived myself. My identity was formed in my family, as opposed to the culture around me. A second barrier I faced was that I’m left-handed, and in Ghana using your left hand with people in your interactions is culturally considered a sign of disrespect. So if I raised my left hand to answer questions in school, some teachers wouldn’t take my answer because they weren’t aware I was disabled. In the culture, if you want to use your left hand in interactions you're expected to apologize beforehand, in order not to make people feel disrespected. Can you imagine if I had to say ‘I’m sorry I used my left hand’ to everyone I interacted with on a daily basis? I didn’t do that, so many people thought I was being disrespectful, especially those who weren't immediately aware that I had a disability. My mom told my teachers in school not to treat me any different from the other kids, so my teachers weren't overprotective either. This made my classmates more accepting because when we got into trouble during play we all got the same amount of punishment. And this made me feel no different from the other kids as well. The only issue was that equal treatment didn't always take into account what I couldn't genuinely do because of my disability, and so it was cruel sometimes. It also meant that I had no accommodations, which was lacking in Ghana anyway. So you either learn to swim or you drown. In a way, this encouraged me to think out of the box to learn how to live without accommodations and still thrive. BLOOM: What made you want to do research about children with disabilities? It meant disability was not how I looked, but what I could do. That shifted my focus. It made me realize it’s what we do with children that would eventually decide whether they will beg on the streets, or not, in adult life. If I put myself in the shoes of those begging on the street, and grew up in their family, maybe I would have ended up in the street. I needed to get into pediatric rehab where I would be able to look at how to promote inclusion and participation of children with disabilities so they could reach their optimal potential. Eliminating barriers in society is very critical, but sometimes it can be difficult to do in the short term. For example, initiatives to remove attitudinal barriers have been going on for years and some progress has been made, but we still have a long way to go. Another example that takes time is redesign of existing architectural structures. So if we can’t remove the barriers in the short-term, is it possible to work with children to help them work around the limitations of their disabilities, and the social barriers they face, to reach their optimal potential? How can we teach children to be able to say, regardless of the barriers I face, that I should strive to live to my full potential? That’s why I was interested in working with Gillian on some of her resilience projects. BLOOM: You mentioned you’re writing up a paper here about a study that looked at parents’ expectations of residential life-skills programs. For example, our Independence Program has youth spend three weeks living on a university campus. Why was there a need for this study? De-Lawrence Lamptey: Even though residential life-skills programs have been going on for a long time, and people have studied various aspects of them, what parents expect their children to achieve, or the program to deliver, is relatively unknown. How participants do after they go home to their family depends partly on the expectations of the family. I grew up in a family that was less protective. But what if parents have low expectations that their child will acquire certain skills? We want to be able to add valuable knowledge to improve the program, so that parents are better positioned to give their children the best support. BLOOM: What kind of research do you most enjoy? De-Lawrence Lamptey: I’ve been privileged to work in the world of describing and evaluating programs. I like to identify best practices in program design and delivery. I enjoy looking at what impact a program actually has on clients and families, for the purpose of using that knowledge to improve. This research helps you do two things. One, most of the time when we look at the services we’re providing, we don’t know what is working, or even when it’s not working. And if it is working, we don’t know why. Every child is so different that even though most of the services we provide are evidence-informed, they may work for some and not for others. It’s very important that we optimize the service for a large group, so we can share the knowledge around the world about the effects of the program. Second, this kind of research gives accountability to funders of the program. They need to know what impact the program is having to determine whether to continue funding it or, if it’s not working, what are the ways we can make it better. BLOOM: What’s most challenging about your research? De-Lawrence Lamptey: It’s mostly work I do sitting in front of a computer and typing, so sometimes I don’t have that much of a social life. I’m always working at a computer or reading and I’m always thinking. It can be difficult to turn it off. Even when I’m on my bike I’m thinking about the paper I’m writing, and if an idea comes to me in the subway, I have to write it down so I don’t forget. Subconsciously my mind is always working. BLOOM: I read an article yesterday by a disabled researcher who said that people working in the field often don’t have disabilities, and tend to view themselves as experts, instead of listening more closely to people with disabilities. De-Lawrence Lamptey: We all have different experiences. I have been fortunate to overcome many barriers to get a PhD as a person with a disability. People with disabilities face multiple barriers that make it difficult for them to acquire the necessary expertise to do the level of research we do. So it’s very important that we work together. The greater challenge, I believe, is that the research we produce should make a lot of sense to users. But unfortunately, if we write in a language that makes sense to people with disabilities or service providers, it can limit the chances of it being accepted for publication into a scientific journal. Every discipline has their own language that they use. So I’m torn. To rise in my career, I need to publish. But that means writing in a way that people who need to implement the research may have difficulty understanding. BLOOM: It bothers me that the research world makes itself exclusive by using jargon that the average person can’t understand. De-Lawrence Lamptey: I think it's really important for us to write in a way that everyone can understand, especially those who use the knowledge. BLOOM: What kind of work do you want to do in the future? De-Lawrence Lamptey: The work I want to do ultimately would be to look at how we could mobilize resources to help people with disabilities in under-served communities in Western countries and in developing countries. I feel the world has given me a lot and I need to give back, and giving back means giving back to people who are most in need. Waaooo. Very insightful and thought provoking. That's my nephew, very proud of you Nii. Great comments, and nice to see the work you are doing in Toronto. Of course your time at Queen's was a msjor stepping stone as well :) Keep going! Congrats Dr. Lamptey, we are proud of you. Keep soaring higher. Cobbie, Ghana. Hello Dr. Lampty! It's very exciting to see what you're doing in this next phase of your life! I wish you all the best in your research, in clarifying for practical application while writing for publication, and in enjoying the process and those that you work with!